Raise Welfare and Disability Grants: Immediately raise welfare and disability benefits above the poverty line. Raise the State Earned Income Tax Credit (EITC) from 30% of the federal EITC to 40%. Guaranteed Minimum Income: Establish a guaranteed minimum income above poverty built into the progressive state income tax, with tax credit payments to those below the minimum paid monthly. Public Jobs for the Unemployed: Enact a public jobs program paying living wages and benefits in public works and public services to meet community-defined needs – state-funded, locally-planned, and prioritizing disadvantaged communities. Raise the Minimum Wage -- $20 by 2020 and $30 by 2030 -- Indexed to Inflation and Productivity: Accelerate and increase the scheduled rise in the minimum wage so that by 2030 it reaches the equivalent of $30 an hour in today's dollars with adjustments to increases in productivity through 2030. It should reach $20 an hour by 2020. If the inflation-adjusted minimum wage of 50 years ago in 1968 had kept pace with the 249% increase in productivity (real output per hour of work), the minimum wage would be $29.43 today. 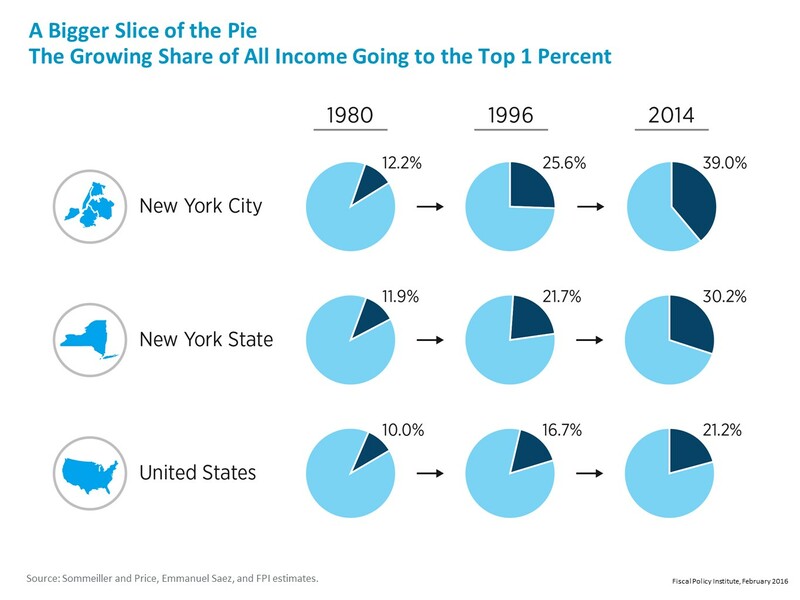 Meanwhile, the share of all income going to the top 1% from 1980 to 2014 increased from 12% to 30% in New York State and from 12% to 39% in New York City. The state minimum wage is not scheduled to reach $15 in the New York City area until 2020 and in the New York city suburbs until 2021. Upstate, the minimum wage is scheduled reach only $12.50 in 2020. These are still poverty wages. All workers should be paid living wages. Target economic development resources to developing worker cooperatives that raise worker income by distributing value added according to labor contribution, not capital ownership. Establish a state public bank with local branches to help plan, develop, and finance worker cooperatives.